Torah study is the study by Jewish people of the Torah, Hebrew Bible, Talmud, responsa, rabbinic literature and similar works, all of which are Judaism's religious texts. Ideally within Judaism it is done for the purpose of the mitzvah ("commandment") of Torah study itself. Although the word "Torah" refers specifically to the Five Seferim of Mosheh, in Judaism the word also refers to the Tanakh (Hebrew Bible), the Talmud and other religious works, even including the study of Kabbalah, Hasidism, Mussar and much more. Sar HaPanim - meaning Prince of Face (Face of HaShem) refer to Yeshua carries heavenly authority- is recited during Rosh Hashanah between the blowing of the shofar. “May it be Your will that the sounding of the shofar, which we have done, will be embroidered in the veil by the appointed angel, as You accepted it by Elijah, of blessed memory and by Yeshua, the Prince of the Face (Face of Hashem) (Prince of God’s Presence) and the one who sits on God’s throne. May You be filled with compassion toward us. Kabbalah (Hebrew: קַבָּלָה‎, lit. "receiving") is a discipline and school of thought discussing the mystical aspect of Judaism. It is a set of esoteric teachings meant to define the inner meaning of both the Tanakh (Hebrew Bible) and traditional Rabbinic literature, as well as to explain the significance of Jewish religious observances. Chillul haShem (Hebrew: חילול השם‎ "desecration of the Name"), meaning desecration of the name of God, is a term used in Judaism for any act or behavior that casts shame or brings disrepute to belief in God, any aspect of the Torah's teachings, Jewish law, or the Jewish community. Any behavior or action that disgraces, harms or shames God and his Law is regarded as desecration of God's name, Chillul Hashem. Every sin a Jew does is Chillul Hashem. Hasidic Judaism (also Chasidic, etc., from the Hebrew: חסידות , Chassidus, meaning "piety", from the Hebrew root word חסד chesed meaning "loving kindness") is a Haredi Jewish religious movement. Some refer to Hasidic Judaism as Hasidism, and the adjective chasidic / hasidic (or in Yiddish חסידיש khasidish) applies. The movement originated in Eastern Europe (what is now Belarus and Ukraine) in the 18th century. Rabbi Yisrael ben Eliezer (1698–1760), also known as the Ba'al Shem Tov , is seen as the founding figure of Hasidic Judaism. Mussar movement refers to a Jewish ethical, educational and cultural movement (a "Jewish Moralist Movement") that developed in 19th century Orthodox Eastern Europe, particularly among the Lithuanian Jews. The Hebrew term mussar (מוּסַּר), is from the book of Proverbs 1:2 meaning instruction, discipline, or conduct. The term can be used to refer to Jewish moral or pious literature in general, see Jewish ethics. Tzniut or Tznius (Hebrew: צניעות, Tzniut, Sephardi pronunciation, Tzeniut; Ashkenazi pronunciation, Tznius, "modesty") is a term used within Judaism and has its greatest influence as a notion within Orthodox Judaism. It is used to describe both the character trait of modesty and humility, as well as a group of Jewish religious laws pertaining to conduct in general and especially between the sexes. The term is frequently used with regard to the rules of dress for women. Humility is a paramount ideal within Judaism. Mosheh is referred to as "exceedingly humble, more than any man in the world" (Bamidbar 12:3). The Talmud states that humility is one of the characteristic traits of the Jewish people (Talmud, Tractate Yevamot 79a). The Tanakh (Hebrew: תַּנַ"ךְ‎) (IPA: [taˈnax] or [təˈnax]; also Tenakh or Tenak) is the Bible used in Judaism. The name "Tanakh" is a Hebrew acronym formed from the initial Hebrew letters of the Tanakh's three traditional subdivisions: The Torah ("Teaching," also known as the Five Seferim of Mosheh), Nevi'im ("Prophets") and Ketuvim ("Writings") - hence TaNaKh. The elements of the Tanakh are incorporated in various forms in Non-Jewish Believers Bibles, in which, with some variations, it is called the "Old Testament." The Talmud (Hebrew: תַּלְמוּד) is a record of rabbinic discussions pertaining to Jewish law, ethics, customs, and history. It is a central text of Judaism, second only to the Hebrew Bible in importance. A hazzan or chazzan (Hebrew חַזָּן ħazzān, Modern Hebrew khazan, Yiddish khazn) is a Jewish cantor, a musician trained in the vocal arts who helps lead the synagogue in songful prayer. Armilus is an anti-Messiah figure in late-period Jewish eschatology, comparable to the Non-Jewish Believers Antichrist, who will conquer Yerushalayim and persecute the Jews until his final defeat at the hands of Elohim or the true Messiah. His inevitable destruction symbolizes the ultimate victory of good over evil in the Messianic age. According to the Jewish Encyclopedia, Armilus is "a king who will arise at the end of time against the Messiah, and will be conquered by him after having brought much distress upon Yisrael", similar to Gog. He is spoken of in both Midrash Vayosha and Sefer Zeruv-Bavel, in which he defeats the Messiah ben Joseph. The origin of this figure, said to be the offspring of Satan and a virgin, or Satan and a statue (or "stone"), is as much involved in doubt as the different phases of his development, and his relation to the Non-Jewish Believers legend and doctrine. Aleinu (Hebrew: עָלֵינוּ "It is our duty to praise") is a Jewish prayer found in the siddur declaring the sovereignty and unity of Elohim. In all likelihood it was composed by Rav in Babylonia in the 3rd centuring. It is recited at the end of each of the three daily Jewish services. It is also recited following the New Moon blessing and after a circumcision is performed. The traditional view of its composition, based on a geonic account, is that this prayer was created and proclaimed by Yehoshua in biblical times. However, the modern scholarly view is that the prayer was composed in Talmudic times for the musaf liturgy on Rosh Hashanah. The Aleinu praises Elohim for allowing the Jewish people to serve Him, and expresses their hope that the whole world will recognize Elohim and abandon idolatry. Anakims = "long-necked"the descendants of Anak (Josh. 11:21; Num. 13:33; Deut. 9:2). They dwelt in the south of Palestine, in the neighbourhood of Hebron (Gen. 23:2; Josh. 15:13). In the days of Avraham (Gen. 14:5, 6) they inhabited the region afterwards known as Edom and Moab, east of the Jordan. They were probably a remnant of the original inhabitants of Palestine before the Canaanites, a Cushite tribe from Babel, and of the same race as the Phoenicians and the Egyptian shepherd kings. Their formidable warlike appearance, as described by the spies sent to search the land, filled the Yisraelites with terror. They seem to have identified them with the Nephilim, the "giants" (Gen. 6:4; Num. 13:33) of the antediluvian age. There were various tribes of Anakim (Josh. 15:14). Yehoshua finally expelled them from the land, except a remnant that found a refuge in the cities of Gaza, Gath, and Ashdod (Josh. 11:22). The Philistine giants whom David encountered (2 Sam. 21:15-22) were descendants of the Anakim. (See GIANTS.) 1) a tribe of giants, descendants of Anak, which dwelled in southern Canaan. The Anakim are said to have been conquered by Caleb (Josh. xv. 14; Judges, i. 20), who received their territory. In Deut. ii. 11, the Anakim are called a branch of the Rephaim, which is perhaps a generic term. Birkat Hamazon, (Hebrew: ברכת המזון ; trans. Blessing on Nourishment), known in English as the Grace After Meals, (Yiddish: בענטשן; translit. bentshn or "to bench"; Yinglish: Benching), is a set of Hebrew blessings that Jewish Law prescribes following a meal that includes bread or matzoh made from one or all of wheat, barley, rye, oats, spelt. It is a matter of rabbinic dispute whether Birkat Hamazon must be said after eating certain other bread-like foods such as pizza. 1. The first blessing, which is a blessing of thanks for the food was, according to tradition, composed by Mosheh in gratitude for the manna which the Jews ate in the wilderness during the Exodus from Egypt. 2. The second blessing, which is a blessing of thanks for the Land of Yisrael, is attributed to Yehoshua after he led the Jewish people into Yisrael. 3. The third blessing, which concerns Yerushalayim, is ascribed to David (who established the capital to Yerushalayim) and Solomon (who built the Temple in Yerushalayim). These three blessings are regarded as required by scriptural law. 4. The fourth blessing, a blessing of thanks for Elohim's goodness, was written by Rabban Gamliel in Yavneh. The obligation to recite this blessing is regarded as Rabbinic only. Maimonides –Mosheh ben-Maimon, called Maimonides and also known as Rambam, was the preeminent medieval Jewish philosopher and one of the greatest Torah scholars and physicians of the Middle Ages. He was born in Córdoba, Spain on Passover Eve, 1135, and died in Egypt on 20th Tevet, December 12, 1204. He was as a rabbi, physician and philosopher in Morocco and Egypt. His full Hebrew name is Rabbi Moshe ben Maimon, whose acronym forms "Rambam" (רמב"ם). In Latin, the Hebrew "ben" (son of) becomes the Greek−style suffix "-ides" to form "Mosheh Maimonides". His full Arabic name is Abū ʿImrān Mūsā bin Maimūn bin ʿUbaidallāh al-Qurṭubī al-Yisraeli ( ابو عمران موسى بن ميمون بن عبد الله القرطبي الإسرائيلي) or Mūsā ibn Maymūn for short. בית Bayit; Beit - house, home; of royalty: palace; of deity: temple; a specific part of a house: room; place; by extension: household, family, clan, tribe ; house ; temple bayit between; among; at a crossroads. בית דין - Beit Din - "house of judgment"; plural battei din) is a rabbinical court of Judaism. In ancient times, it was the building block of the legal system in the Biblical Land of Yisrael. Today, it is invested with legal powers in a number of religious matters (din Torah, "matter of litigation," plural Dinei Torah) both in Yisrael and in Yehudim communities in the Diaspora, in the Torah that the ruler divest his legal powers and delegate his power of judgment to lower courts was made by Yetro to Mosheh (Shemot 18:14–26). Elohim had gave the explicit command to "establish judges and officers in your gates" (Devarim 16:18). "You shall appoint judges and officers in all your towns according to the Birkat (grace) Yehowah Eloheicha has given to your tribes, and they shall judge the people with righteous judgment. To the Goyim communities there are similar principle applied An ecclesiastical court, also called Court Christian or Court Spiritual, is any of certain courts having jurisdiction mainly in spiritual or religious matters. Mat 5:24-25 leave your gift there before the altar and go. First be reconciled to your brother, and then come and offer your gift. Come to terms quickly with your accuser (opponent in a lawsuit) while you are going with him to court, lest your accuser hand you over to the judge, and the judge to the guard, and you be put in prison. Also Read 1 Korinthos 6:1-11 about Believer going into lawsuit. Judaizer (Galetes 2:14) Judaizers were a group that believed that following Torah forced HaShem to grant one salvation. That salvation came without grace. they taught that Gentiles must be circumcised and keep the Law of Moses in order to be saved. YESHU - is actually an acronym for the formula (ימח שמו וזכרו(נו ) (Y'mach Sh'mo V'Zichro(no)) meaning "may his name and memory be obliterated blot out". Adar is the 12th month of the Jewish calendar. The word Adar means strength. When there are 2 months of Adar in a calendar year,Purim is celebrated in the second Adar,in order to connect the redemption of Purim to the redemption of Passover Adar is the month of the tribe of Naphthali which means sweetness is to me. ZARIM are GENTILES who are not member of the commonwealth of Yisrael. They worship other gods. NOKHRIM is a derogatory form of ZARIM. NOKHRIM are GENTILES who are not member of commonwealth of Yisrael. They don't worship anything. They think that there is no gods. They live just for eating, marrying and then die. Exactly like animals. Ger toshav (Hebrew: גר תושב ger "foreigner" + toshav "resident" are general mention in the scripture as GENTILES who worship the G-d of Yisrael, but they are not obligated to observe the Torah. If they want to observe the Torah, they can. It is a term in Judaism for a gentile living in the Land of Yisrael who observes the Noahide Laws and certain religious and cultural traditions under Jewish law and is therefore commonly deemed a righteous gentile (Hebrew: חסיד אומות העולם chassid umot ha-olam "Pious People of the World") A ger toshav is a Gentile who accepts the authority of the Torah and the Rabbis upon himself, but specifically as applied to Gentiles. The term ger toshav may be used in a formal or informal sense. To abstain from idolatrous practices (detailed in Deut 29:09-30:20). To uphold all the 613 commandments in rabbinical enumeration, except for the prohibition against eating kosher animals that died by means other than ritual slaughter, or possibly (Meiri) any prohibition not involving kareth. A "Ger Tzedek" GENTILES who are fully true converted to worship the G-d of Israel who became a Jew out of a sincere and deep conviction in the truth of the Jewish religion, without any other motivation whatever. They are obligated to the Torah as Jews. Although DNA-ly they are not Jews, but they are Jews inwardly. Indeed, this is the only kind of conversion that the Torah recognizes. The word ger comes from the Hebrew verb lagur (לגור) meaning "to reside" or "to sojourn [with]". In the Hebrew Bible ger is defined as a "foreigner", or "sojourner." A male convert to Judaism is referred to by the Hebrew word ger (Hebrew: גר‎, plural gerim) and a female convert is a giyoret. 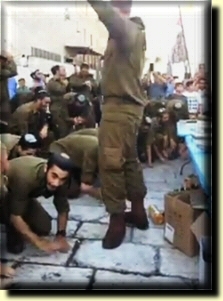 Baruch Atah HASHEM (ADONAI) Eloheinu Melekh ha-Olam, ha-motzi lechem min ha-aretz. Blessed are You, HASHEM (ADONAI) our G-d, King of the universe, who brings forth bread from the earth. Baruch Atah HASHEM (ADONAI) Eloheinu melekh ha-olam, she-hecheyanu ve’kiyemanu ve’higianu laz’man hazeh. Blessed are You, HASHEM (ADONAI) our G-d, King of the universe, who has kept us alive and sustained us and has brought us to this special time. Beat on the Ground: "They sing Am Israel Chai and beating on the ground, because the soil on which they are standing is their Land. The prayer translated is: the nation of Israel shall live ... so the beating on the ground refers to that they will live forever on that soil, on that Land. Eretz Israel - the Land of Israel."